The space shuttle Discovery soars into the night sky above the Kennedy Space Center in Florida on Aug. 28, 2009 at 11:59 pm ET to begin a 13-day mission to the International Space Station. This story was updated at 2:42 a.m. EDT. 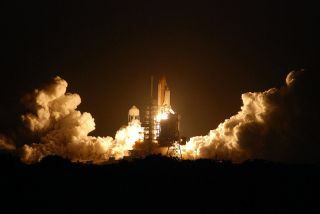 The spaceshuttle Discovery turned night into day above Florida late Friday as it blazedinto the midnight sky carrying seven astronauts bound for the InternationalSpace Station. Discoveryrocketed into the dark sky above NASA?s Kennedy Space Center at 11:59p.m. EDT (0359 Aug. 29 GMT) to begin a 13-day space station resupplymission after two launch delays earlier this week. ?This timeMother Nature is cooperating so it looks like third time really is the charm,?NASA launch director Pete Nickolenko told Discovery?s crew just before liftoff. ?Thanks toeveryone who helped prepare for this mission,? shuttle commander Rick Sturckowradioed back. ?Let?s go step up the science on the International Space Station.? Stormyweather threatened to delay the flight during the countdown, with severallightning strikes within 5 miles (8 km) of the launch pad, but abated in timefor the successful liftoff. Some minor bits of ice were spotted on Discovery?sfuel tank before launch, but were not a concern for launch, NASA officialssaid. "You know, I'll take it," said Mike Moses, head of Discovery's mission management team, after launch. "It'll be an exciting and challenging mission and we look forward on getting to it." Bad weatherthwarted Discovery?s first launch attempt on Tuesday and was closely followedby a hydrogen fuel valve glitch that prevented a second try. The fill-and-drainvalve is a critical component in Discovery?s main propulsion system. It workedflawlessly during the shuttle?s midnight launch Friday. Discoveryis hauling nearly 8 tons of cargo to the International Space Station, includingnew science gear, crew supplies and a treadmill named after televisioncomedian Stephen Colbert. NASA named the treadmill for Colbert after the?Colbert Report? host?s fans won an online poll to name a new space stationroom. DespiteColbert?s popularity, NASA named the station module Tranquility - after theApollo 11 moon base - but renamed the treadmill the Combined Operational LoadBearing External Resistance Treadmill (or COLBERT) as a consolation prize. NASAinvited Colbert to watch his treadmill namesake launch into space, but thecomedian was unable to attend. He did, however, record a video message forNASA. ?I couldn?tbe prouder that my treadmill will soon be installed on the International SpaceStation to help finally slim all thosechubby astronauts,? Colbert said in the televised message this week. ?Youguys and gals are our ambassadors to the universe, don?t make us look bad. Putdown the astronaut ice cream tubby!? Launchingto space with Sturckow on Discovery are shuttle pilot Kevin Ford and missionspecialists Patrick Forrester, Jose Hernandez, Danny Olivas, Nicole Stott andSwedish astronaut Christer Fuglesang, who represents the European Space Agency.The mission is only the second flight to boost the space station?s populationto 13 people since the outpost?s permanent crew increased to six spaceflyers inlate May. Threespacewalks are planned for their STS-128 mission to upgrade the space stationand replace a massive ammonia coolant tank that weighs as much as a small car. Each of theastronauts flashed different hand signs to cameras, presumably messages tofamily and friends, before boarding Discovery. Hernandez, a former migrant farmworker turned astronaut, waved at a video camera, tapped his heart and said ?Ilove you all? before boarding Discovery. He and his wife have five children. NASAlowered flags at the Kennedy Space Center to half-mast at the launch site inmemory of Sen. Edward Kennedy of Massachusetts, who died of brain cancerearlier this week. Discovery?ssix-man,one-woman crew will deliver a mix of supplies and science gear tothe space station, as well as a new crewmember, Nicole Stott, to join theoutpost?s six-person Expedition 20 crew. Stott willreplace fellow NASA astronaut Tim Kopra aboard the station as a flightengineer. Kopra has lived aboard the station since mid-July and will return toEarth on Discovery. Stott, meanwhile, is beginning a three-month space mission- the first spaceflight of her career. She said she?s looking forward tosettling into life in orbit. ?I?mlooking forward to that point in time where I just one day think ?Wow, thisdoesn?t seem weird anymore. It seems normal not to have to walk anymore,?? shesaid in a recent briefing. Packed inDiscovery?s payload bay is a cargo pod crammed with about 15,200 pounds (6,894kg) of equipment and supplies. ?Most ofthe things, I think, which we bring up is to kind of both keep the six crewalive there and also to make it a little more comfortable life for them,?Fuglesang said in a NASA interview. ?So we have a lot of food, for example. Butwe bring up several big facilities.? Some ofthose new facilities include a new freezer for storing biological samples, tworefrigerator-sized racks for materials science and fluid physics research, aswell as a small drawer with six mice inside as part of a bone loss study. Themice will return to Earth during a November shuttle mission. Theastronauts aboard Discovery are following an off-kilter overnight schedule thatrequires them to sleep in the morning and wake up for their next day?s work inthe late afternoon. They will go to sleep Saturday at 6:29 a.m. EDT (1029 GMT)and are due to wake up in afternoon at about 2:29 p.m. EDT (1829 GMT) to begintheir first full day in space, one aimed at inspecting their heat shield fordamage. Bill Gerstenmaier, chief of NASA's spaceflight operations, said an early review found that Discovery's external fuel tank did not shed excessive amounts of foam insulation like that seen during the shuttle Endeavour's launch last month. That preliminary look, he said, found little evidence of any foam loss at all, though more analysis will be performed as a standard check. "The tank appeared to perform extremely well," Gerstenmaier said. "We didn't see anything like we saw on the last tank." NASA has kept a close eye on foam debris during launch since the 2003 Columbia tragedy. Friday?slaunch marked the 128th shuttle mission for NASA and the 30th fight to theInternational Space Station. It is Discovery?s 37th flight and NASA?s 33rd shuttlemission to launch at night. It came just two days ahead of the 25th anniversaryof the shuttle?s first flight in 1984. The mission is also NASA?s 15th shuttleflight since the 2003 loss of shuttle Columbia and its seven-astronaut crew. Discovery?smission is NASA?s fourth of up to five shuttle missions planned for 2009. Theagency plans to fly six more flights after this one to complete space station constructionbefore retiring its three-orbiter fleet in 2010 or 2011. A White House panel is reviewing NASA's human spaceflight plans for President Barack Obama and is expected to file a report that includes several alternative options in upcoming weeks. Discoveryand its seven-astronaut crew are due to land Sept. 10.